With its indoor farm in Guelph, Ont., nearing completion, TruLeaf Sustainable Agriculture is plotting its next phase of growth with more farms, a licensing model for its technology and a new round of funding. 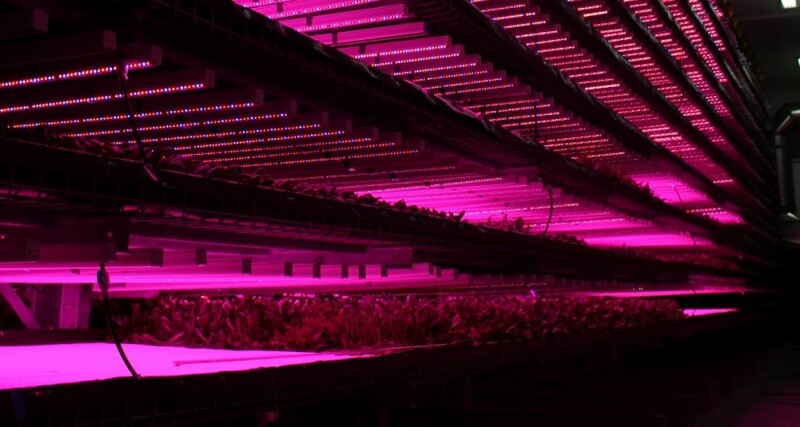 Gregg Curwin, founder and CEO of the Halifax vertical farming company, also says the company is focused ever more on machine learning and data analytics to help it produce the most nutritious local food possible. Halifax-based TruLeaf aims to be a leader in sustainable agriculture through the use of vertical farming — which combines proven hydroponic technology with advancements in LED lighting and reclaimed rainwater to allow year-round production of plants indoors. Vertical farming is nearly 30 times more efficient than traditional agriculture, uses as much as 95 per cent less water, and takes up less land. Curwin told a panel discussion at the Big Data Congress last week that the company is now focusing on applying advanced technology to the process of growing plants indoors. The Guelph plant — which is due to be completed in June, will be fully automated and TruLeaf is looking into using data to improve the process of growing nutritious food. “The light bulb that’s going off for us is all about machine learning and data,” said Curwin. Rebecca Costa Tells Halifax Audience to 'Predapt'. Curwin said that in the controlled environment of its growing facilities, the company can monitor data produced over time from the creation of the seed to shipping grown food to the supermarket. Outdoors, a farmer can get 40 points of data in his or her career; TruLeaf can get 10,000 data points in 10 days at its indoor farms. One example of TruLeaf’s experimentation is the work it has been doing with LED lighting. The company is experimenting with how different plants grow under different light spectrums, and what lighting is best at specific phases of the growing process. It is even examining whether special lighting in a supermarket shelf can prolong the freshness of produce. Curwin added that the company is investigating whether there is a direct link between adding certain greens to your diet and improving cognitive health. It is interested in producing in Nova Scotia a vegetable prominent in West Africa, where dementia rates are really low. The last 18 months have been busy ones for TruLeaf. It closed an $8.5-million financing round last December and has been working with Loblaw Companies, the parent company of Atlantic Superstores, on the development of its farms. Appearing under the company’s GoodLeaf Farms brand, products grown in the company’s farm in Bible Hill are now available in a dozen Superstores spanning the three Maritime provinces. According to the TruLeaf website, the products include broccoli shoots, kale shoots, daikon radish shoots, pea shoots, baby arugula and baby kale. The company now has 38 employees in Nova Scotia. “We’re eliminating low-level jobs and most of the jobs we are creating now are . . . in computer science, engineering and plant science,” said Curwin.